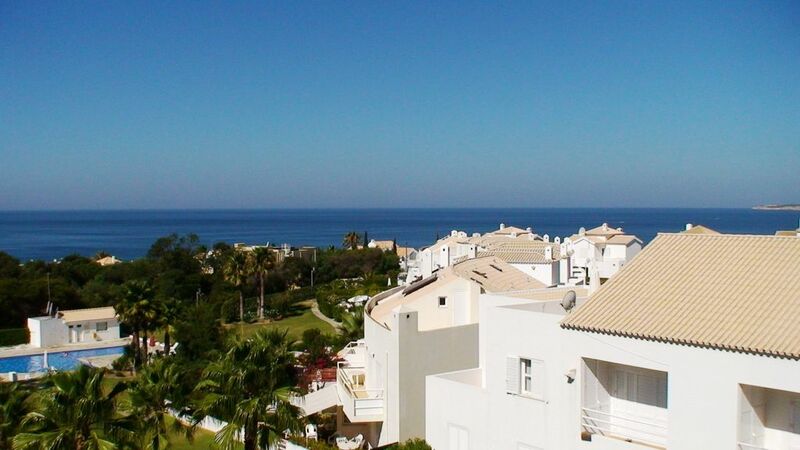 The town home Torre Atlantico is in the peaceful holiday complex Monte da Galé in Praia da Galé on the Algarve in Portugal. The residential tower with about 140 m2 on three levels has 3 bedrooms, 3 bathrooms, a living room w/gallery & panorama view, a fully equipped kitchen and balcony with surrounding porch and terrace. From the bedroom on the ground floor, you also have access to a small garden. The sea with one of the most beautiful coasts in Europe and the beach can be reached in about 3 minutes on foot. By the lower bedroom, you have access to a small garden. In the complex, you will find a communal pool, which is ideal for smaller children. Next to the town home Torre Atlantico is the apartment Torre Atlantico. Both units are separate from each other and have separate entrances. Sport & recreation: Sport options nearby include fishing, golfing, kite, horse riding, surfing, sailing and diving. Furthermore, you can also go on boating tours, deep-sea fishing or safaris in the mountains. You can also rent bicycles for low prices and enjoy wonderful tours. One of the most beautiful golf courses on the Algarve 'Salgados Golf' can be reached quickly. The bird protection region of 'Salgados' can be reached in a few minutes on foot, there are protected bird types here that you can watch, depending on the season you can even see flamingos. The beach of Praia da Galé: The long beach of Praia da Galè 'Praia Grande' is about 6 km long and also ideal for small children. You can walk along the beach to Amacao de Pera. The beach to the east is surrounded by cliffs. Small bays form complete beaches, where you can swim without being disturbed. On request, you can rent toys, a crib, high chair or beach towels for a security deposit. Excellent location is an easy to walk to beach, shopping, groceries and restaurants. This multi level townhouse is in a great location and is well stocked for self catering (although some basic supplies such as dish soap, toilet paper and laundry soap could have been provided). The 3 bedrooms have ensuite bathrooms and are spread out over 3 levels allowing for privacy in our group of 5. The linens and particularly the pillows need updating and a deeper cleaning of the house and patio will make guests more comfortable. Overall, a terrific place to stay with a wonderful view and fantastic pool. Stayed for a week early July. The Accomodation is absolutely fantastic. Almost like 3 self contained flats within the house. It is easily big enough for 6 adults. We had friends staying over the road in the Villa Gale hotel (paying a lot!) who all said this house was far better than where they were staying. The pool area is lovely, and was very quiet even in July. The views from the top level balcony of the house were fantastic. Wir hatten einen wunderschönen Aufenthalt im Torre Atlantico. Das Haus entspricht zu 100 Prozent der Beschreibung und bietet genügend Platz für 6 Personen mit drei abgeschlossenen Schlaf- und Sanitärbereichen und geschmackvoll eingerichteten und großzügigen Gemeinschaftsräumen, sowie Terrassen- und Gartenanteilen. Der Ausblick von der Galerie des Hauses auf das Meer und in die Wohnanlage bietet Tag für Tag atemberaubende Momente mit traumhaften Sonnenuntergängen. Am Meer, das in nur wenigen Metern erreichbar ist, kann man wählen zwischen kleinen, traumhaft schönen Badebuchten mit mehreren Verpflegungsmöglichkeiten sowie Loungebars oder einem kilometerlangen Sandstrand, der ausgiebige Spaziergänge und sportliche Aktivitäten zulässt. Der Vermieter ist äußerst aufmerksam und hilfsbereit und telefonisch jederzeit erreichbar. Auch die Verwaltung vor Ort ist präsent und für alle Wünsche offen. Vielen Dank für den tollen Aufenthalt in Ihrem Torre Atlantico. wir waren zu fünft in dem Haus, und es gefiel uns super gut! alles wie beschrieben und die Bilder entsprechen den Tatsachen. es waren zwei wunderschöne Wochen, natürlich auch dank dem schönen Wetter. Para llegar a la playa solo hay que bajar una calle y está bastante cerca. La casa es ideal para tres parejas porque tiene una habitación doble en cada planta con baño privado en cada una. Es una casa muy bonita con vistas al mar y desde la última planta a 360º. Menaje más que suficiente. La única pega es que suele haber cortes de agua en la zona y aunque no los haya falta fuerza para usar dos duchas a la vez y a veces sale un hilillo de agua insuficiente. La limpieza un poco regular y las almohadas son cojines no muy cómodos. Resto muy bien. Wir waren mit 5 Personen in dem tollen Haus. Es hat an nichts gefehlt. Überragende Aussicht, dicht am Strand, super schön eingerichtet. Wir haben ein paar unvergessliche Tage erlebt und können das Haus zu 100% weiterempfehlen. The holiday complex Monte da Galé in Praia da Galé is 6 km west of Albufeira. From the Faro airport you can reach the city in about 40 min. Praia da Gale consists primarily of villas, small resorts and a few hotels and have a lot of shopping facilities and restaurants of all price classes. The marina of Albufeira is only a 5-minute drive away, from here you can go on great boating or sailing tours. With the fast train, you can get to Lisbon in 3 hours. The train station is in Ferreiras by Albufeira. Activities: to the Zoomarine Park it is about a 10 min. drive. Two waterslide parks are about a 20 min. ride away. Horse riding through the sand dunes a 5 min. drive. You can also go on excursions to local markets or other places on the Algarve, because Gale is in the middle of the Algarve. Golf: One of the most beautiful golf courses in the Algarve - the course 'Salgados Golf' is nearby (18 hole course, par 72, 6080 meters) between Faro and Lagos are about 20 other courses. Im Preis eingeschlossen sind:Bettwaesche,Hand-und Geschirrtuecher Foehn(in jedem Bad),Strom und Wasser,woechentliche Reinigung mit Waeschewechsel ,sowie Endreinigung . Es sind bis zu zwei Hunde erlaubt .Gerne koennen Sie bei uns kostenlos Decken und Naepfe ausleihen. Pro Hund kommt eine Pauschale von € 25.- pro Aufenthalt dazu . Im Preis eingeschlossen sind: Bettwaesche, Hand- und Geschirrtuecher, Foehn (in jedem Bad), Strom und Wasser, woechentliche Reinigung mit Waeschewechsel , sowie Endreinigung . Die Endreinigung ist im Mietpreis enthalten . Außerdem steht Ihnen einen Kamin zur Verfügung , preiswertes Brennholz bekommen Sie in nächster Nähe .